Move your character around the world of Monkey King Online by clicking a spot on the map. Click and hold the mouse button to have your character follow the cursor. Press Z to auto-collect items dropped by enemies. You can also click on an item to pick it up. Items left on the ground disappear after a short time – don’t miss out. Press B to open your backpack or click the Backpack icon at the bottom of the screen. 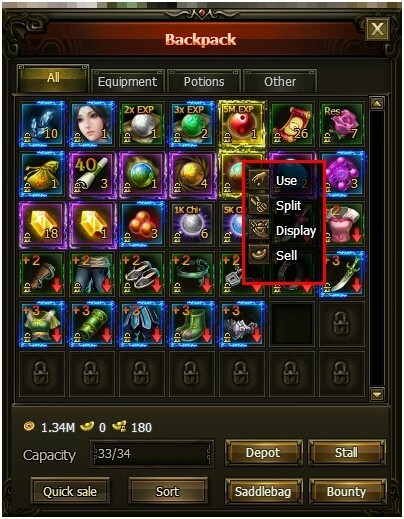 Click an item once to see a list of ways you can interact with that item. 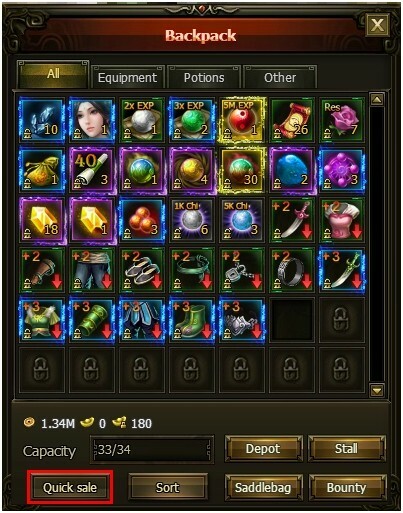 If you double-click most items, you will usually be taken to the screen where you can use that item. Hover your mouse cursor over any item icon - even those you do not own - for more information. You can find out all kinds of key information, including how to acquire more of that item as well as information about expiration dates. As with many RPGs, you may collect items for which you simply have no use. Fortunately, you can easily sell off unnecessary items using the ‘Quick sale’ button in your backpack. First click on the ‘Quick sale’ button, then click on items you wish to sell for Gold. You can always buyback items you did not mean to sell in your Saddlebag. You recover HP, MP, and stamina while meditating, but you will most likely use meditation to gain Chi and EXP. There is a meditation button in the bottom right of the main screen, but it is much faster to meditate by simply hitting the X button. If your character moves or if you leave the game you will stop meditating. Left-click to select a target. Double-click to begin attacking. Use the hotkeys 1-5, Q, W, and E in battle to toggle skills and transformations. If active combat isn’t for you, use A to go AFK and your character will automatically use skills. ENTER Send a message when chatting.